I take great pride in the Northeastern Pennsylvania pizza scene, and I wouldn’t trade it for the world because I believe we do have some of the best pizza in the world, but that doesn’t mean I don’t try to broaden my horizons! I’ve frequently said over the last few years that I’d love to fly to Chicago and do a pizza tour just to see what authentic Chicago Style pizza is like. Unfortunately things like cost, time off, lack of interest from people who want to fly to a city to do a pizza tour have prevented me from taking such a trip. Fortunately I have a good friend who gave me a thoughtful gift that brought Chicago to me by buying me a Lou Malnati’s Pizzeria gift certificate. If you are not familiar with Lou Malnati’s, they offer a world famous Chicago Style deep dish pizza that can be eaten in Chicago, or mailed directly to your doorstep. 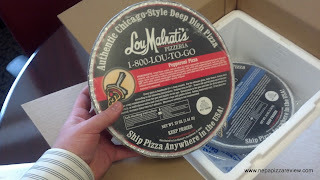 Now, you may be thinking “OK so they mail you frozen pizzas, what’s the difference between Malnati’s and Digiorno?” Well, before I received this gift, I truly couldn’t answer that question for you, but I was eager to find the answer and I surfed on to www.loumalnatis.com to see what I could get for my $50 gift card. Upon checking out the prices, I thought that they were a little steep throughout the entire catalogue, but when you consider the cost of packaging, dry ice, and overnight shipping, the costs started to make some sense to me. 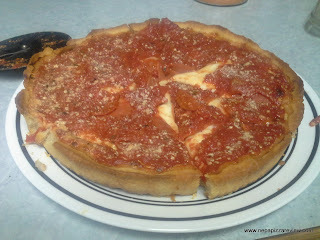 I ultimately decided to get two 9 inch deep dish pizzas – 1 with pepperoni and 1 with sausage. I’m usually a plain pizza guy, but the cost of a topping was the same as a cheese, so I figured why not GET MORE! I ordered the pizzas on a Wednesday night, and they arrived at my doorstep on Friday morning. 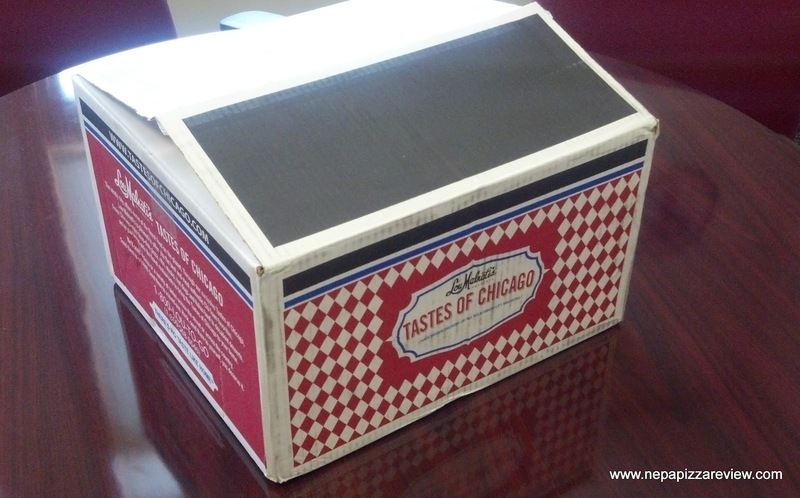 The company guarantees that the package will arrive anywhere in the United States within 48 hours, and the delivery went off without a hitch as advertised. When I picked up the box, I was surprised by how large and how heavy it was for just two pizzas, but after opening it up it made sense. Inside the box were a fresh catalogue, cooking instructions, and a Styrofoam cooler which I actually plan on using again in the future to put 6-packs of bee…uh…SODA in there! After opening the cooler, I found two pies neatly packaged and frozen over dry ice. The pizzas came in their own nine inch aluminum pans, which was fantastic because all I needed was an oven and a little time, and I would be chowing down on this baby soon! The cooking instructions were straightforward and simple. The directions called for an oven to be preheated to 450 degrees, and for the pizza to cook on the middle rack for 40 to 45 minutes. After moving the shelf to the middle of the oven, the only extra step is to remove the pizza from the pan, wipe off any condensation, and apply a little bit of oil to the pan before putting the pizza back in the pan. After completing these tasks, I thought to myself this was the easiest pizza I’ve ever cooked! After popping it in the oven, I could hardly stand the wait to try this pizza out an review it, but finally the time had arrived and I pulled the spectacular looking pie out of the oven. To provide a shout-out to my buddy over at Frozen Pizza TV, I performed the “Photoshop Test” by comparing the catalogue’s photo to the finished product and I would have to say this thing passed with flying colors! Before I get into specifics, let me start by saying the crust on this pizza is unbelievable by both frozen and fresh pizza standards! 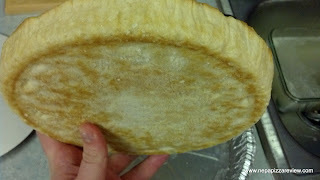 I had moderate expectations going into this review, but this crust was far beyond anything I expected. After being cooked for 42 minutes, the pizza was so crispy throughout that I couldn’t believe my taste buds. Before baking, I chose to add a little extra virgin olive oil to the pan, which I believe added even more flavor to an already perfect crust. 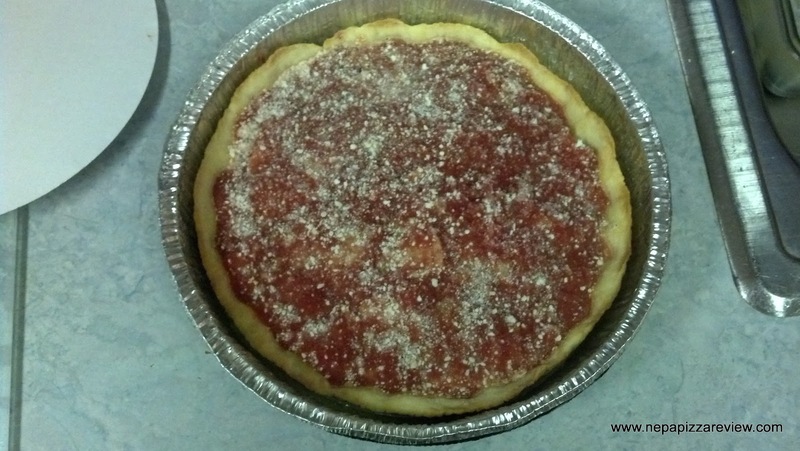 As you can see in the pictures, this pie is constructed a little differently than most pizzas. From the bottom up, the order of components is crust, mozzarella cheese, pepperoni, sauce, Parmesan cheese. So I told you about the crust, so let’s work the rest of the way from the bottom up. The cheese is in a very thick homogeneous layer on top of the dough. There was a pretty leathery and brittle texture to the cheese which reminded me of biting into a deep fried mozzarella stick, so I have to say I wasn’t a huge fan of the cheese. I can justify why the manufacturers elected to go the route of applying the cheese in this order and quantity as they need to keep the moisture of the sauce away from the dough so that the dough cooks nicely after freezing and shipping. On top of the cheese was a very generous layer of pepperoni. 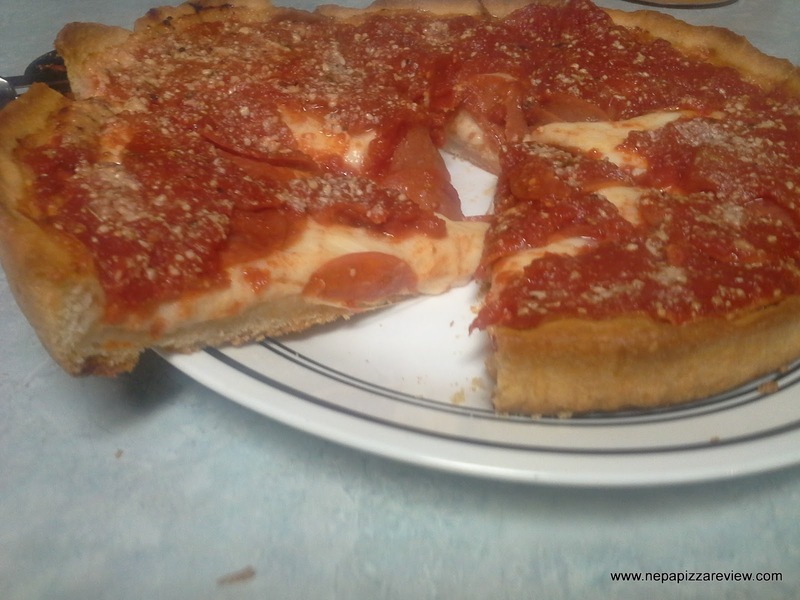 In most cases the more toppings the merrier, but here the pepperoni tasted like microwaved lunch meat and added quite a bit of saltiness to the pie. On top of the pepperoni lied the next component that totally cancelled out the sauce and pepperoni issues, because I truly enjoyed the hearty sauce. The tomatoes were chunky and fresh, with just the right amount of seasoning to complement the ripe tomatoes. To top the whole thing off, a sprinkle of Parmesan cheese perfectly complemented the tasty sauce. 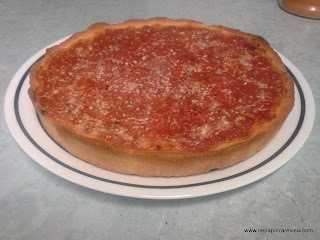 Overall, I was very impressed with the pizza, as it is not easy to freeze something and make it cook up this well. I didn’t care for the thick cheese and salty pepperoni, but the bulk of the pizza was absolutely to die for. Honestly, if I could have ordered the crust, sauce, and a sprinkle of Parmesan I think I may have died and went to pizza heaven. Instead, I enjoyed this tasty pizza a little too much and will probably die for real a little sooner because I ended up eating the whole pizza! Now, no human being should eat this much pizza, because this pie can comfortably feed 2 people, but out of excitement, and walking past the dinner table a few times throughout the course of an evening, I did end up consuming the entire thing. The bottom line is, if you have a pizza lover in your life, this is an excellent gift to give - especially if he is difficult to buy for like me! Enjoy this review? 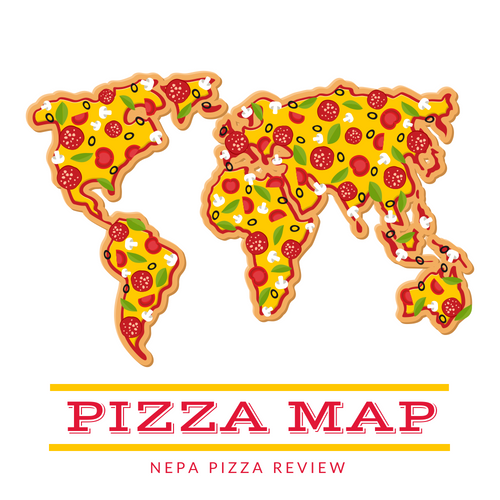 Follow me on twitter and facebook for many more free reviews, recipes, features, and pizza adventures!